TOKYO, Japan (CNN) -- Given the magnitude of Japan's recession, it should perhaps come as little surprise that the fantasy-obsessed animation industry has received a hard dose of reality. 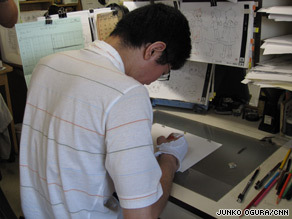 Nobuki Mitani is an "in-between" animator -- one of the lowest paid positions in animation. Yasuo Yamaguchi, executive director of the Association of Japanese Animators, said the industry has been rocked by the country's deepest recession since World War II. "The spread of free Internet downloading is having a deadly effect," he said. Japanese animation is roughly a $2 billion-a-year industry. Revenues peaked in 2006 but have since fallen off, as lower advertising revenues lead to fewer new programs. Unlike some big screen animated features from the United States that rely almost completely on computer animation, in Japan, almost all features are drawn by hand -- a labor-intensive craft practiced by thousands of young artists each year. For the last six years, Nobuki Mitani, has been working as an "in-between" animator -- filling in the cells between "key" animations. It is one of the lowest paid positions in the animation hierarchy. Many of these entry-level jobs have been outsourced to the Philippines and South Korea in recent years. Mitani, 27, said the hours are long, and the pay is low -- about $800 a month. "Every day I work about 10 to 12 hours," he said. "Often, we work on Saturday, and if it's busy, we work Sunday, too." In Tokyo, the world's most expensive city, that means living in cramped conditions. Mitani lives in a tiny one-room apartment with no air conditioning. In summer, the room is sweltering. "I try not to drink water," he said, "to control the sweating." He has a shared sink at the end of the hall where he can wash his hands and face, but to bathe he has to go to a public bath. At the Tokyo Animation Institute, the classrooms are filled with students honing the craft, faces close to their sheets of paper, the only sound a hum from the electric pencil sharpener. The school's director, Yosuke Shimizu, said he knows many of his graduates will quit their first jobs after just months. "Within half a year, some will take freelance jobs, some will take a key drawing job, and some will become sketch directors. Those who are good enough never complain about how hard the job is," he said. At Toei Animation Studios, conditions are better for the animators than in smaller studios. Toei has produced countless successes over the years, including the "Dragonball" series and the ongoing favorite "One Piece." But even here animation is an intense, demanding job. Naotoshi Shida has been working at Toei for 25 years. He said it takes much more than just a love of drawing to succeed. "If someone is thinking of doing this just because they love drawing, that's called a hobby. They'd better think of doing something else."